8 ounces mozzarella cheese (or cheddar, or a mixture of both)Brown ground beef and minced onion. Drain grease. Add tomato sauce, basil, oregano, garic powder and salt. Allow meat and sauce to simmer about 20 minutes. Boil pasta according to package. Drain and stir pasta into sauce. Add cottage cheese, stirring until everything is evenly mixed. Pour into a casserole dish (9×13). 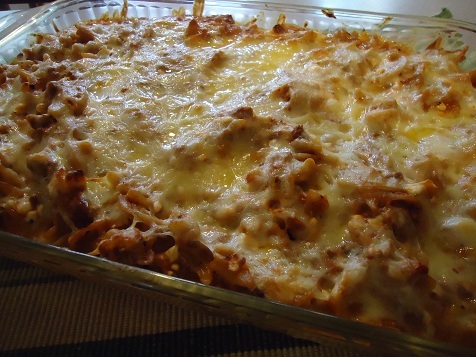 Top with cheese. Bake at 350 degrees, uncovered for about 25 minutes or until cheese is melted and casserole is bubbly. If you freeze this dish, be sure to allow at least a day to thaw on the countertop, or two days in the fridge before baking.